Borrowed some 'props' from DGS. 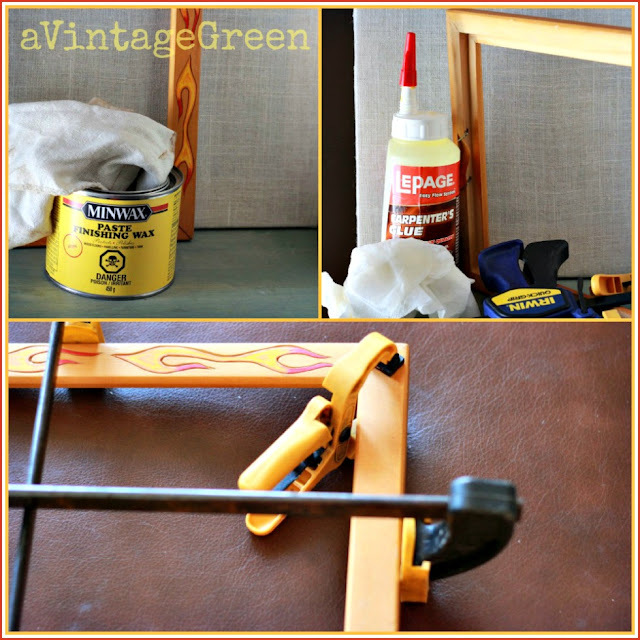 Rust-oleum Black Chalkboard paint and paintbrush, Minwax Paste Finishing Wax, waxing cloth. Used CeCeCaldwell Vermont Slate Chalkpaint for back (not necessary but looked better than the raw wood). 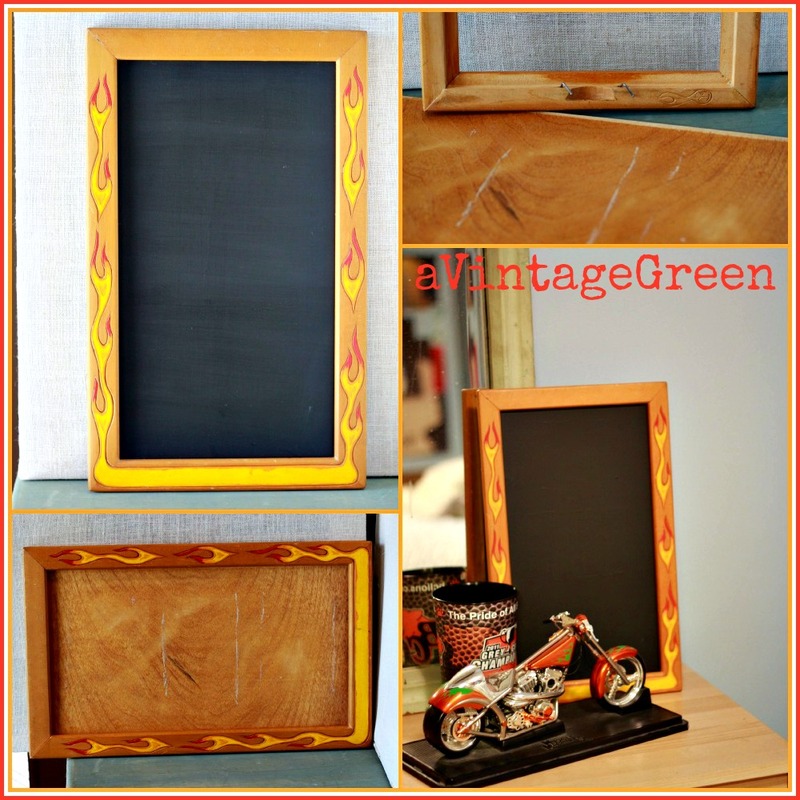 Removed thin board from frame (turned the nails sideways and pushed wood out), gave board 4 coats of black chalkboard paint, letting it dry well between coats. Arrow Tip: put the board on a base (like a round plastic jar top) so that it can be managed, drips removed etc. as it dries. Drips can be scraped off the back with a thin bladed knife. 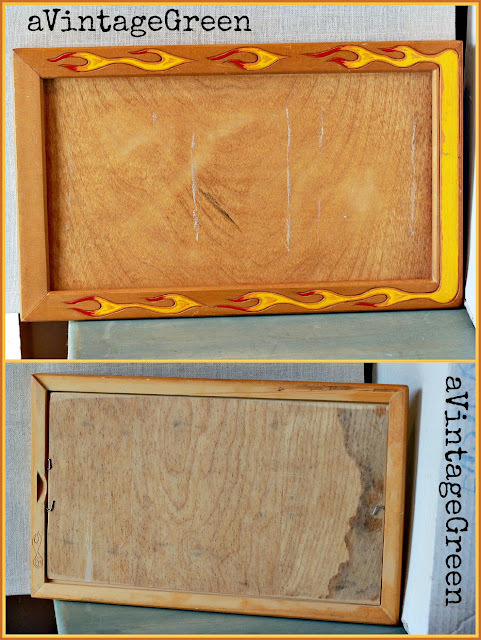 Waxed the frame - and discovered one corner was not glued. Glued, clamped, dried. I think I need a corner clamp, was sure I had one, could not find it. wood glue, damp paper towel, various sized clamps. What I learned: nothing is really as fast, easy or straight forward as it looks at first glance. I seem to learn this little lesson with most projects. Just need to rub the chalkboard with chalk and dry wipe clean. Done. 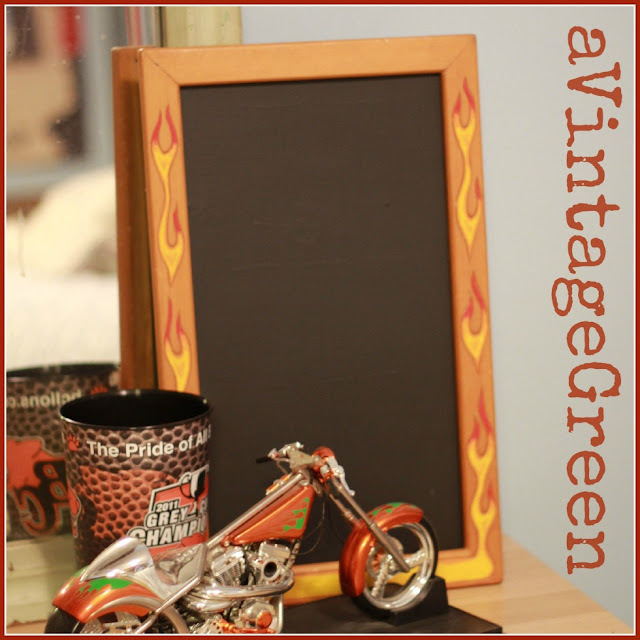 Chalk board paint must be washed off surfaces, hands, paintbrush right away. It dries VERY hard and is very tough to remove after it dries. Joy this is so well done and great for a guy! Just perfect for that theme!! Great idea and perfect for a young boy or guy! Thanks for sharing, have a happy day! This is too cool! 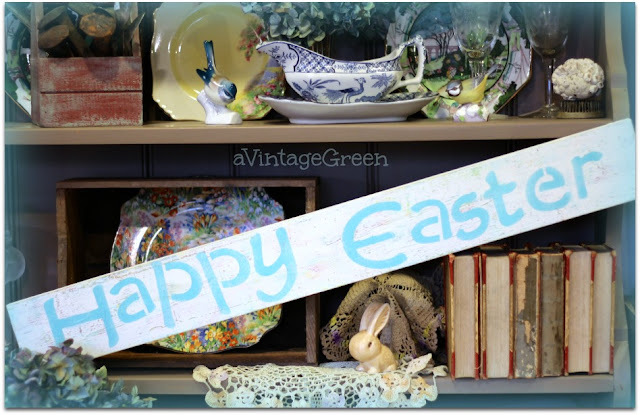 Would you please come on over and share at my creativity blog hop? Oh great idea. It's so nice to see decorative things for the boys, too. Great makeover, it looks awesome. Vroom, Vroom! That chalkboard is ready to roll. I immediately thought of it paired with a collection of vintage Hot Wheels! 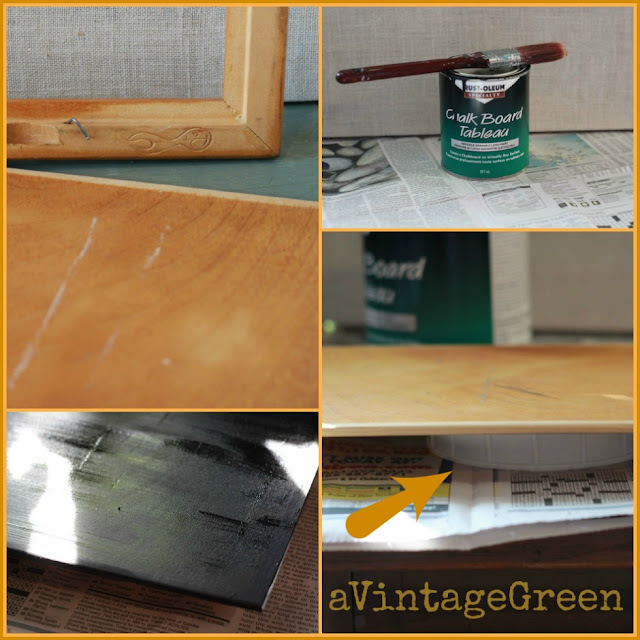 Good tip about the chalkboard paint; it is popular to repose things with. Your project turned out well. Happy St. Patty's Day, Joy! What a great post. I love the step by step tutorial you have shared. What a great redo. I love the thrifty makeovers best. Thank you for stopping by my blog and for your thoughtful comment. I appreciate it so much. What a fun idea! Thanks for linking this up to Monday Funday! Great idea! It looks very cool next to that little motorcycle! Awesome idea to pair it with that bike! I just did the sides of our fridge in chalkboard paint. It certainly has gained in popularity lately! Perfect project for a boy. Love it. Thanks for sharing at the Cabin. You're inspiring to me. For some reason I become more "crafty" in the Spring. I love your blog because it motivates me! What a great idea for my sons room. Thank you Joy for linking up at Fluster's Creative Muster. Hope to see you next week! What a great little makeover! Thanks for sharing at Silver Pennies Sundays! Hi Joy, looks great with the motorcycle model. It's always fun to see things with a more masculine side. Thanks for sharing with SYC. Really cute - love the flames!